I was busy making almond and cashew butters yesterday. And while I was at it, I decided to make tahini butter and paste. These are clean, with no preservatives or sugar and so easy to make. They are also so much more economical than ready made ones. Cashew, almond and tahini butter. For the tahini paste, I used raw sesame seeds and for the tahini butter, I used roasted sesame seeds. I roasted the sesame in my non-stick wok over a medium flame. You need to stir them constantly, otherwise they might burn. All the butters tasted awesome. Can’t wait to start using them.So all you have to do is to be a bit patient and process them until they turn into a smooth paste. I warmed up my almonds in a preheated oven for just a few minutes before I processed them. Did not roast them, just warmed them up. I did the same for the cashews. This way they are easier to blend and more oil is released. I processed them, stopping every now and then to scrape off the sides. Took around 15 minutes for each. Sesame seeds were much quicker. Tags: almond, almond butter, cashew, cashew butter, clean eating, food, paste, raw eating, sesame, tahini butter, tahini paste. Bookmark the permalink. 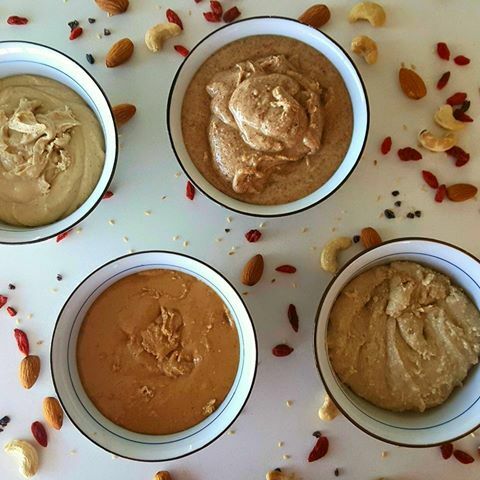 I’ve made my share of almond and peanut butters but never thought of making tahini! What’s the difference between tahini paste and tahini butter? 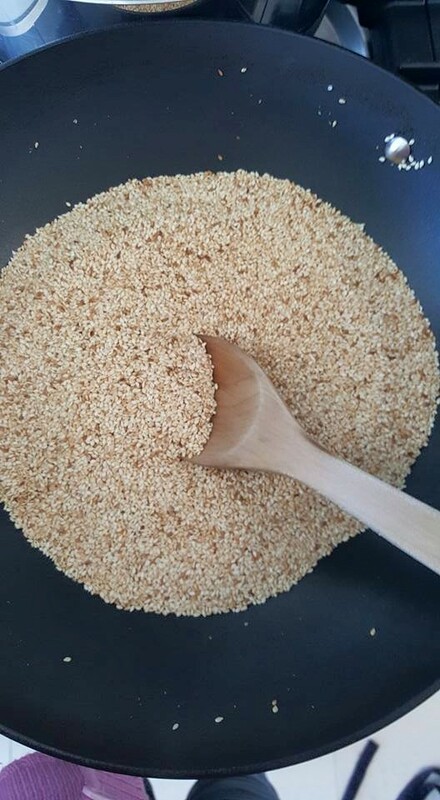 Tahini paste is grinded raw sesame seeds, tahini butter is grinded roasted sesame seeds. It’s thicker and has a different flavour… i love both..
Homemade nut butters are just such fun to make and so easy and you can be much more creative than what comes in a jar can’t you? Love the overhead photo with the nuts! Happy 4th of July. Absolutely Teresa. Easy, delicious and so natural. Thank you so much, glad u liked my photo, and a happy 4th of July to u too. I’ve also had fun making my own nut butters – although it’s always scary to see how many nuts it takes to create a small amount of butter! I tried making tahini but I didn’t have the right food blender to achieve a smooth finish, maybe I’ll try again in my Nutribullet. Did you use any particular sesame seeds? And did you have to add any oil? Hi Elaine, yes it’s incredible isn’t it! !